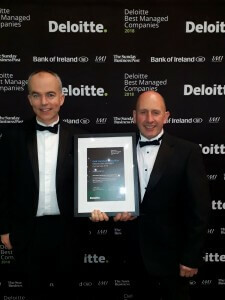 Anaconda announced as one of Ireland’s #BestManaged Companies with Deloitte Gold standard award for fifth year! performance, was recognised at an awards gala dinner in Dublin on 15 March 2018.
from the Irish business community. of over €12 billion. 26 of the 32 counties across the island of Ireland were represented by winning companies.